The following information is vital so please treat what you read with the utmost respect. It's a sad fact, but young, inexperienced drivers are more likely to be killed or seriously injured in a crash than other road users. That's why the Road Safety Authority has introduced new measures to help learner drivers to become safe and socially responsible road users. One of these measures is essential driver training, known as EDT, which will help you, the learner driver, develop some of the most vital driving skills as well as improve your knowledge and understanding of road safety. If you received your first car learner permit on or after the fourth of April 2011, you must undertake at least 12 hours of essential driver training with an approved driving instructor, known as as an ADI, before you can take your driving test. Many learners require more than just 12 lessons and support or filler lessons are advised. OKAY I GET IT! LETS GET STARTED...BOOK ME IN! It is very important to choose someone who can help you to practice what you've learned between your driving lessons with ourselves. This person is known as your sponsor, and their role is to practice the skills you are learning with our ADI and to support you as you become a more confident and capable driver. Your sponsor plays an important role in helping you to develop driving skills and confidence, so make sure this is someone you trust and who demonstrates safe driving behavior. He or she must have held a full category B license for more than two years. Each lesson is one hour long and we recommend that you leave at least two weeks between lessons, so that you can practice what you have learned, study and take any additional lessons you might need with our ADI. Remember, you can't take your driving test for at least six months after you receive your learner permit, so there was no benefits to doing the lessons quickly. Before you attend your first EDT lesson, make sure you have everything you need and have done any preparation required. Our ADI will check your learner permit and if you use your own vehicle for the lesson, our ADI will check the insurance, motor tax, NCT and the roadworthiness of the vehicle. If our ADI is unhappy with any of these, he or she may not go ahead with your lesson. Remember, your car does not require an NCT until it is four years old. 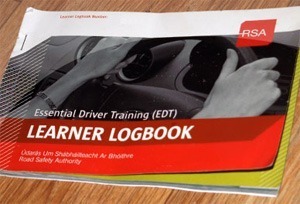 At your first lesson, our ADI will talk you through the aims of the EDT course and give you your logbook. It's very important to keep this in a safe place. Your logbook sets out the details of each lesson on the EDT course. As you complete each lesson, our ADI will record your EDT progress in your logbook, sign and stamp it. It is most important to ensure that you are ready to undergo each of the 12 EDT lessons, so ask our ADI about your readiness when you are booking your next driving lesson. Once you have completed lessons one to eight, lessons nine to 12 can be completed in any order, as by then you will have built up the necessary skills and experience. Further information on what's involved in each EDT lesson can be found in the RSA booklet, Essential Driver Training, learner driver information booklet, which is available from your ADI and can be downloaded from the RSA website . our ADI will record your progress and detail recommended next steps for you in your EDT logbook, so it's important that you bring this with you to every lesson. After each lesson, take the time to complete the self-analysis page, show your logbook to your sponsor, you can check your progress and see what needs to be practiced. Your sponsor should log practice sessions in the relevant pages of your logbook. Before your next lesson, make sure you read the relevant sections in the rules of the road. It is also useful to discuss your lessons with your ADI who will give you advice on what you should study and practice before your next lesson. To support you as you learn to drive, the RSA has produced a helpful manual called Learning to Drive a Car, which is available in book stores. Through a combination of lessons with our ADI and practice with your sponsor, EDT will help you to develop the necessary skills and experience to be a better, safer and socially responsible driver. Check with our ADI that he or she has uploaded your EDT lesson records. You can visit My EDT on the RSA website and review or print off your personal record. Once you have completed your EDT course and have held your learner permit for at least six months, you can sIt your driving test.. You can apply for your practical driving test online at the official driving test website, RSA.ie. For more information on passing the driving test first time see our driving test page above and why every post EDT Learner we have passes their driving test first time.